There is an app for shopping, fitness, and just about everything else and luckily there are quite a few for mindfulness and meditation. In truth there are plenty of mindful apps well worth looking into some are perfect for anyone who wants to combat anxiety, other for an increase on focus, plenty promise better sleep others help with weight management. The biggest hurdle is probably finding the one most suited for you, there are quite a difference when it comes to apps created by professionals opposed to those made by people new to the practice. The list below gives you a quick summary of each of the apps we found could be the perfect option for a wide reader-audience. A flood of daily micro-meditations that only lasts around three minutes each makes Aura one of the most popular mindfulness apps available, it helps users with anxiety and to relieve stress via a simple technologically advance hugely effective meditation platform. The app was created by highly qualified therapists and further personalized by AI. Aura users also have the option to track their moods during the day, keep a gratitude journal as well as listening to nature sounds. It is the perfect app for those who have stressful schedules and limited time to practice meditation. 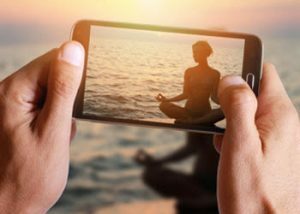 The app is loved by thousands due to its simplicity, ability to create a sense of well-being and peace, although to repeat some of the meditation clips a few times you will need to invest in the full app. It is one of the most amazing free apps for anyone who are new or advanced in meditation. It offers supportive guidance and tools from the time you wake up to bedtime as well as five-minute long meditation sessions. Many have complemented its tip to overcome pressure, and enjoy inner peace, living with intention and feeling love. The app can be customized and is extremely user-friendly, users can set favourites and get recommendations. Organized sessions of meditation organized by theme and according to where the user is in the day. It is by far the most popular for anxiety, recommended by most therapists and can be personalized to deal with stress, cope with trouble sleeping. This app offers more than eighty meditation and it is great for the modern working environment while some users have used it for well over three years and still won’t even consider changing over to any other app. Buddhigy is a high-quality app used by professionals, leaders and teachers and many improvements has been added over the years. It is an app that brings a sense of clarity to your day, joy, as well as peace. Millions of users voted it as the greatest app to help you transform your life in an extremely positive way. Calm provides the most relaxing sounds and users can choose the relaxing falling rand or to be greeted by celestial white noise, crickets or a crackling fireplace sound. 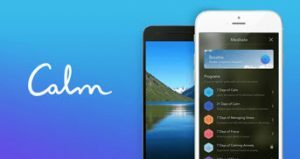 The calm app includes short meditations brilliant for during the day use and the app is well worth the money most users say. It offers all the meditation practice you could require as well as increase your focus while many have enjoyed huge results.